I lost my source info. about this guitar & amp, but just had to post the photo anyway. 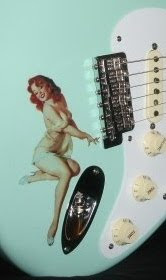 The Strat belongs to a guy in Oklahoma, and reportedly once belonged to Eldon Shamblin of Bob Wills & The Texas Playboys. Eldon was playing Strats way before Buddy Holly, having been given an early Strat prototype by Leo Fender himself, at which time Shamblin put down his big Gibson Supers and stuck with Strats for the rest of his career. 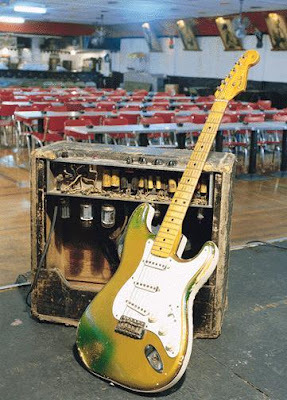 The amp looks like an old Deluxe that's seen more than it's share of trucks, trains, trunks, grange halls, brews, tar & nicotine... and loose women too. If anyone recognizes this photo or anything about it, please leave a comment!! I'll add more details, credits & links if/as they become available.